NKBA – THE INDUSTRY'S BEST NETWORK OF PEERS, TOOLS, AND RESOURCES – BRINGS YOU THE LATEST DESIGN INSPIRATION AND INDUSTRY INTELLIGENCE 365 DAYS A YEAR. EXPERIENCE KBIS 365 AT NKBA.ORG WE SPENT THREE AMAZING DAYS TOGETHER IN JANUARY. ...AND YOU HAVEN'T CALLED US SINCE. 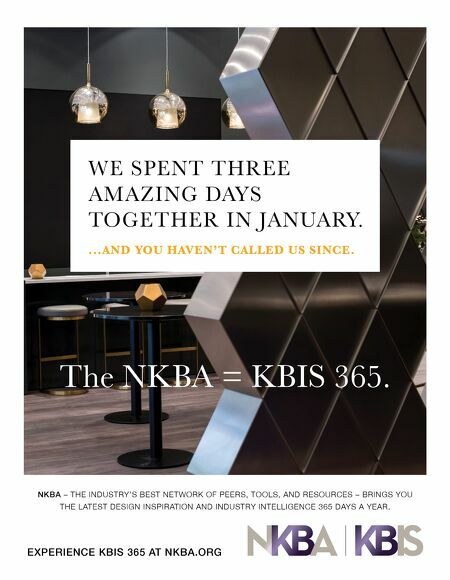 The NKBA = KBIS 365.